Are you busy Christmas shopping? I definite have been and, since part of our family will not be visiting for Christmas this year, I am relying a lot on the internet. One of my absolute favorite online stores is ModCloth. They have adorable, vintage-inspired clothing and accessories for women at fantastic prices; espcially during the ModCloth ‘Tis The Season Sale. ModCloth doesn’t only have clothing, however, they also have the cutest, retro home decorations. Check it all out right now! Ok, it is time to party! 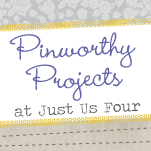 Did you create something Pinworthy this week? Thanks for inviting me to the party! Love your website. I too have a mathaholic engineering husband. I guess we balance out the math side with the more creative side! I just started following your blog, please come back to mine and follow me too! Cheers! Thank you o much for the party and reminder email. Thanks so much for hosting!! Have a fabulous weekend! Thank you for hosting Shannah! !